Arianespace’s small launcher, the Vega rocket, has lofted the Sentinel-2B Earth observation satellite on Monday night (local time). Sentinel-2B becomes the fifth satellite launched for Copernicus following its lift off from Europe’s Spaceport in Kourou, French Guiana. The launch was on schedule at 01:49 UTC (Tuesday). Sentinel is the space segment of Copernicus, consisting of six different types of satellite to study different aspects of the planet. Copernicus is headed by the European Commission in partnership with ESA. It provides accurate, timely and easily accessible information to improve the management of the environment, understand and mitigate the effects of climate change, and ensure land monitoring, emergency management and security. Sentinel-1 satellites carry radar imaging payloads, Sentinel-2 spacecraft are used for optical imaging, Sentinel-3 vehicles perform an oceanography mission, Sentinel-4 will study Earth’s atmospheric composition from geostationary orbit while Sentinel-5 will carry out the same mission in low Earth orbit. Sentinel-6, which is a successor to the Franco-American Jason spacecraft, will carry radar altimeters to measure variations in the height of sea surfaces. Sentinel 1, 2, 3 and 6 are free-flying satellites, while Sentinel-4 and 5 will be payloads hosted aboard the next-generation Meteosat and METOP spacecraft respectively. At present, one satellite each of the Sentinel-1, 2 and 3 series are in orbit, with the remaining series due for introduction in the early 2020s. An interim satellite, Sentinel-5 Precursor (Sentinel-5P) will be launched in 2017 to restore ESA’s ability to monitor atmospheric composition in the troposphere, which was lost after Envisat ceased operating in 2012. Sentinel-1A was the first member of the constellation to be launched, riding a Soyuz to orbit in March 2014. It was joined by Sentinel-2A, which launched aboard a Vega in June 2015 and Sentinel-3A which was launched by a Rokot from the Plesetsk Cosmodrome this February. Sentinel-1B – a 2,164 kilogram (4,771 lb) satellite which was constructed by Thales Alenia Space – was launched by a Soyuz ST-A rocket last year from the Centre Spatial Guyanais, in Kourou, French Guiana. Based around the Piattaforma Italiana Multi-Applicativa (PRISMA) satellite bus, the spacecraft is designed for a seven-year mission in sun-synchronous low Earth orbit although it carries sufficient propellant and resources to operate for up to twelve years. The satellite is equipped with a synthetic aperture radar operating in the C-band, which can image with a resolution of up to five by five meters (16 by 16 feet). The latest satellite will hook up with its sister. Sentinel 2B will boost the capacity of the fleet. 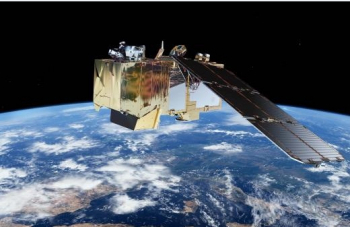 “Sentinel-2B will be the fifth satellite launched for Copernicus,” added Josef Aschbacher, Director of ESA’s Earth Observation Programs, ahead of the launch. “The Sentinels already in orbit are providing massive amounts of data: 6.5 petabytes so far. 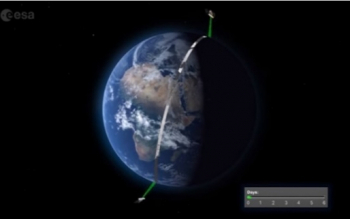 Sentinel-2B will be positioned in an orbit opposite that of Sentinel-2A to ensure optimum coverage and data delivery. 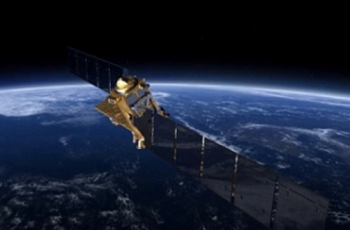 The pair of Sentinel-2 satellites will cover the Earth’s entire surface in five days. This high frequency means they will capture brand-new views of the Earth, driving considerable progress in monitoring and predicting changes in vegetation and aquatic pollution. That will be achieved thanks to an innovative high-resolution multispectral camera with 13 spectral bands for a new perspective of land and vegetation. The combination of high-resolution, novel spectral capabilities, a field of vision covering 290 km and frequent revisit times will provide unprecedented views of Earth. 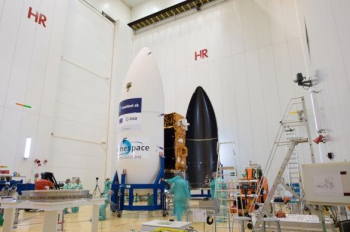 Like its sister, Sentinel 2B was launched by Arianespace’s Vega rocket. 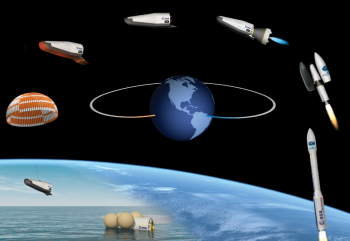 The four-stage launcher is tailored to carry the growing number of small scientific spacecraft and other lighter-weight payloads under development or planned worldwide. During her early career, she has proven her versatility by successfully lofting a range of spacecraft into orbit. By offering configurations able to handle payloads ranging from a single satellite up to one main satellite plus six microsatellites, Vega has a busy life ahead of her. 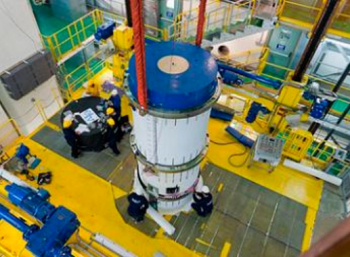 Arianespace started work on the vehicle back in 2003 – as much as the origins of the concept range back to the 1990s – with ELV SpA (Italy) the lead manufacturer. Vega utilizes a P80 advanced solid propellant first stage motor, featuring a novel filament-wound casing structure, utilizing new-generation, high-quality production techniques. Standing almost 11 meters tall, and with a diameter of three meters, the P80 has an overall mass of 95 metric tons and burns approximately 88 tons of solid propellant in slightly less than two minutes. 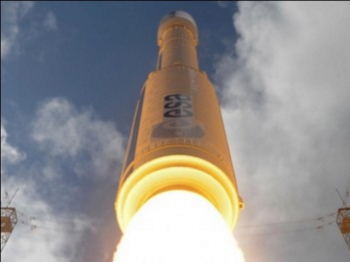 The P80 generates 300 tons of thrust to power Vega during its initial ascent from French Guiana. The second and third stages – designated Zefiro 23 and Zefiro 9, respectively – also use solid propellant motors, while the launcher is topped off by the bi-propellant liquid upper stage (called AVUM – Attitude and Vernier Upper Module). 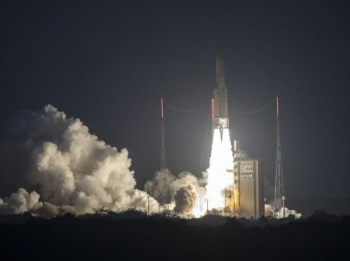 Although the debut launch was originally targeting 2007, the first mission – designated VV01 per Arianespace’s system – enjoyed a successful launch, carrying nine satellites into space during its February 12, 2012 mission. The success qualified the overall Vega system, including the vehicle, the ground infrastructure and operations, from the launch campaign to the payload separation and disposal of the upper module. In particular, the mission demonstrated the vehicle’s performance and payload services. One of Vega’s most interesting missions to date was the successful launch of the Intermediate Experimental Vehicle (IXV), which took place in 2015. This latest mission was called Flight VV09 – signifying the ninth mission performed by the lightweight Vega launcher. The launch took place from the Vega’s ELA-1 launch pad. Variously designated Zone de lancement Vega (ZLV), Ensemble de lancement Vega (ELV) and Site de lancement Vega (SLV), the pad was originally built in the early 1970s for the European Launcher Development Organisation (ELDO). A single Europa II vehicle was flown from Guiana by ELDO, failing to achieve orbit with a vehicle evaluation payload. This proved the final launch of the Europa rocket, however in 1979 its successor, the Ariane 1, made its maiden flight from the same complex. The pad, designated Ensemble de lancement Ariane (ELA) and later ELA-1 after a new pad was constructed for the Ariane 4, supported 25 Ariane launches between 1979 and 1989, ending with the final flight of the Ariane 3. With the larger Ariane 4 and later 5 rockets flying from ELA-2 and ELA-3 respectively, ELA-1 fell into disuse and was decommissioned. Rebuilt for Vega in the late 2000s, the complex now serves as that rocket’s only launch site. 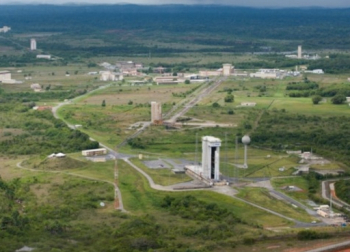 This Vega mission is part of another busy year for Arianespace’s launch services, with a total of 12 flights targeted during the 12 months from French Guiana using its family of vehicles, composed of Vega in the light-lift category, the medium-lift Soyuz, and the heavy-weight Ariane 5. The Vega launch follows year-opening missions with the company’s other two launch vehicles: performed February 14 with the heavy-lift Ariane 5 to orbit the SKY Brasil-1 and Telkom 3S telecommunications satellites for Brazil and Indonesia; and on January 27, utilizing a medium-lift Soyuz to loft Hispasat 36W-1, Europe’s first “SmallGEO” relay platform. Current planning – to be confirmed based on payload availability – foresees up to seven Ariane 5 launches during the year, joined by three missions utilizing Vega and two with Soyuz.